The ‘Longest Marathon Drumming By A Team’ record has been smashed this week, beating the previous record by over four incredible hours! The new Guinness World Record breaking team is comprised of world famous drummers as well as Alumni and students from ACM (The Academy Of Contemporary Music) in Guildford. 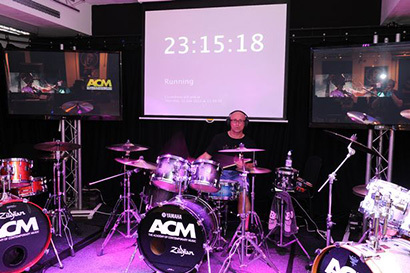 The challenge, which took place in ACM’s Roger Taylor Zildjian Studio, spanned a whopping four days and 70 hours and included over 35 drummers. Even ACM tutors and renowned drummers Pete Riley, Mike Dolbear and Craig Blundell took part in the record attempt, with each drummer spending two hours behind the kit. The previous record holders received their title back in 2009 after 11 different drummers played for 3 days and achieved 66 hours play-time. ACM wanted to gain the title to demonstrate that “the school itself is a leading provider of drum tuition and a great example of pioneering music education”. The event was organised by ex-ACM student, and children's oral health campaigner, Ian Aguado-Bush. Ian’s aim was to help support the Clean My Teeth campaign, which raises money for the British Dental Health Foundation, Heart Your Smile and Bridge2Aid. Zildijan and Vic Firth both supplied 48 pairs of drumsticks in partnership with the college and the event.